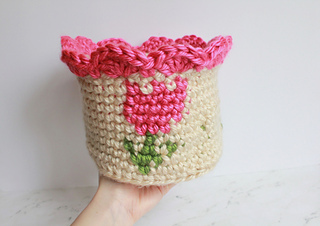 Bring a big of spring into your home with this adorable crochet tulip basket! 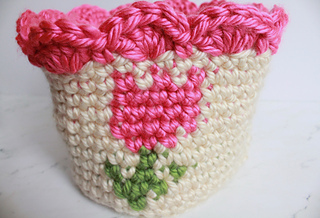 With a bright flower design, this cute basket is the perfect way to bring some happiness to your decor. 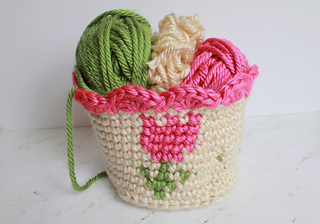 Using the tapestry crochet technique, you add your own flare to this cute basket by making it in whatever colors you’d like. Pattern is made with Lion Brand Hometown USA, but can be made with any super bulky yarn. The color chart shows the flowers in pink. 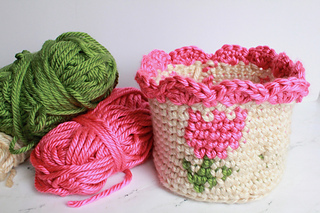 The pink can be substituted with any color though, and you could even do 3 different colors. If you have any questions about this pattern at all, feel free to send me a message and I’m happy to help! 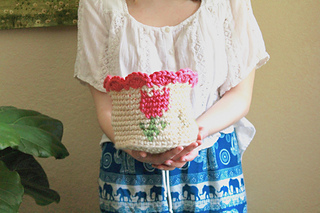 Every pattern you purchase from me helps make my dreams of being a crochet designer a reality!